Hi friends, this post contains affiliate links. 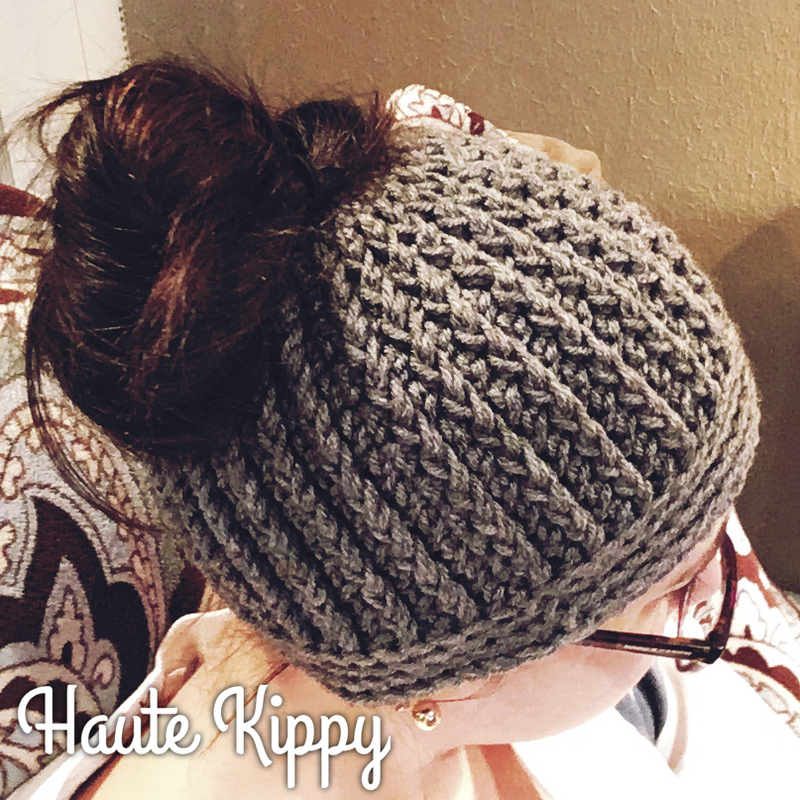 Are you still loving the messy bun hat trend? I sure am! I think lots of designers and crocheters are just getting started and some may even have designs stashed away for next fall. Here in West Virginia it seems spring is already upon us. We've had a banner week of warm and unseasonable temperatures- but that doesn't mean winter is over. We usually have a final snow at the end of the season around Easter, and I'm on the lookout for the temps to drop. That's why I've got one more bun hat for you this winter. Like my other design this hat is made from the top down starting around an elastic hair tie. I really love using post stitches. They create such great texture and long lines. I've also had fun working the the third loop of crochet stitches. Another pattern that uses this technique is my Luxury Spa Wrap. You can read that guest post for more information about how to crochet in the third loop. The technique is described in detail in the main post on Stitch and Unwind. If you'd like to own this pattern in a clean, portable, printer friendly, ad-free version, a PDF download is available in my Etsy shop, OR click the buy now button to get it from my Ravelry shop! 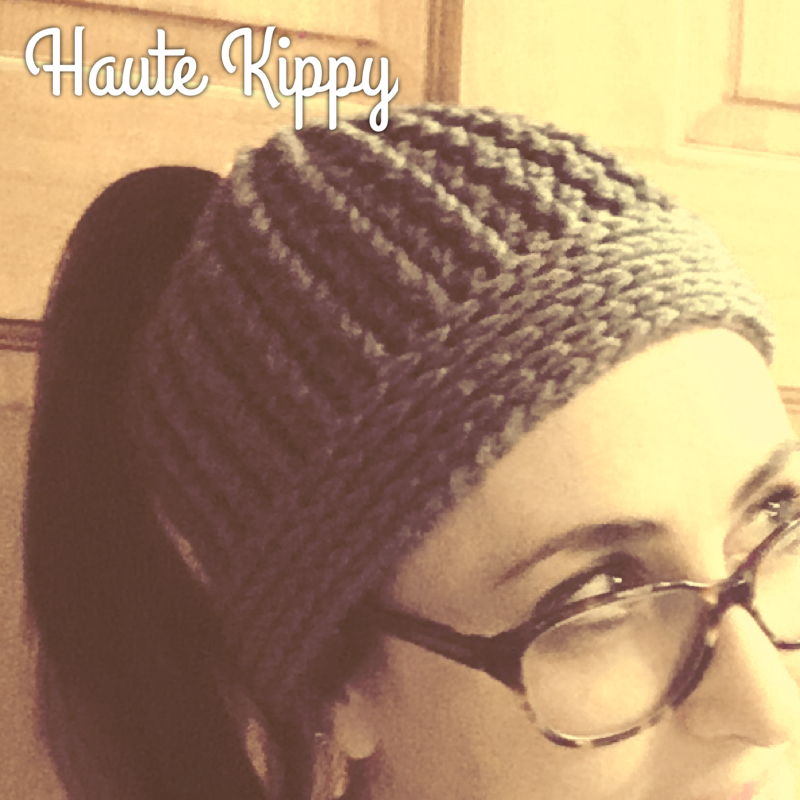 Thanks for supporting more free content from Haute Kippy! ...and this is my favorite yarn! I simply adore the feel and workability of Red Heart's With Love line. The Gina hat featured is photographed in Pewter. Gauge: 6 sts = 2" in hdc and 5 rows fpdc = 2"
Finished size: apx 20" around and 7.5" from elastic to brim before stretching to fit. fpdc- front post double crochet: yo, insert hook from front to back around post of indicated st on the right side of work, yo, and draw up a loop, yo draw thru 2 loops, yo draw thru last 2 loops on hook. fpdc made. hdc in 3rd loop: keeping right side racing, yo, insert hook into third loop (horizontal bar located directly below "v") on the wrong/back side of the indicated st, yo draw up a loop, yo draw thru all loops on hook. This forces the "v" on the top of the stitches of the prev round to fold over and face outward, creating a horizontal "knit-look" pattern on the right side of the work. Note: Turning chs at beg of rounds do not count as sts. Make first st of round in same st as turning chs. Be sure to meet gauge to obtain size listed in pattern. Feel free to adjust hook size or number of rounds before brim in order to make a custom fit. Round 1: Join yarn to elastic hair tie and ch 1, hdc 30 around hair tie, join with a sl st to first hdc, ch 2. Round 4: dc in first st, fpdc in the next, *dc, fpdc*, repeat ** around, join, ch 2. Rounds 5-12: repeat round 4, ch only 1 at end of round 12. Round 13-15: hdc in third loop of each st around, join, ch 1. Round 16: sc in the third loop of each hdc from the prev round, join, do not ch. Round 17: sl st loosely in each st around, join, fo. Hint- a blind join looks great here, at the end of round 17. Here's how: sl st around until one st remains. Cut yarn leaving long tail for weaving in ends. Pull tail all the way through last sl st, eliminating the loop your hook went through. Thread yarn needle with tail. Sew yarn tail under "v" of next st (the first sl st made), and through the other side. Sew tail in through middle of the last "v" made and out on wrong side of work. Invisible join made. Knot tail once and then weave in ends as normal. And there you have it! The fabulous plush ridges of the Gina Bun hat, with a stylish knit look brim. Rounds 5-14: repeat round 4, ch only 1 at end of round 14. Round 15-17: hdc in third loop of each st around, join, ch 1. Round 18: sc in the third loop of each hdc from the prev round, join, do not ch. Round 19: sl st loosely in each st around, join, fo. 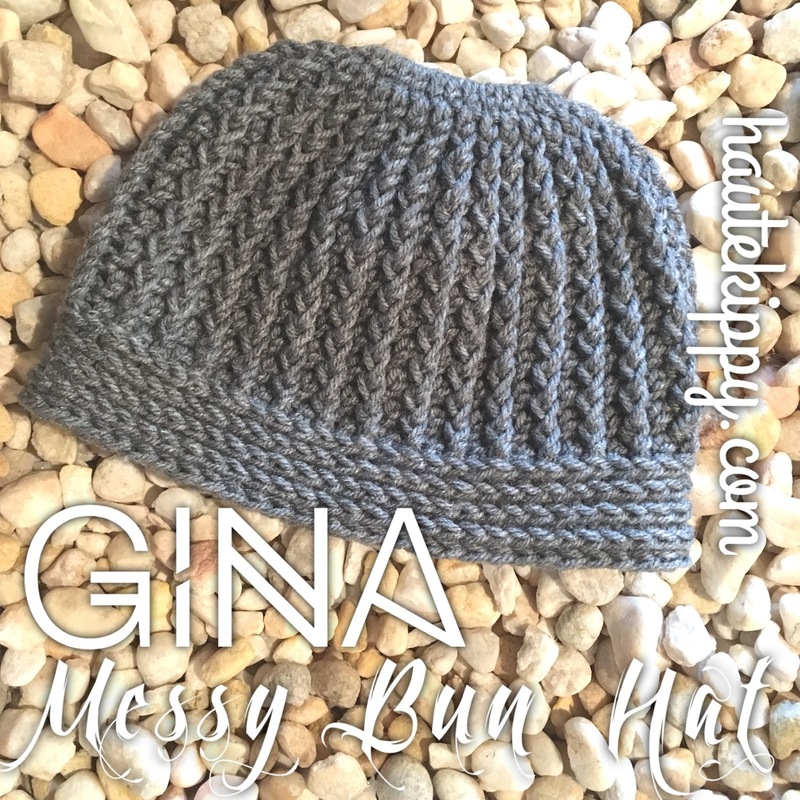 And that should do it to convert the Gina Bun Hat into the Gina Beanie! Let me know what you think of this conversion, and if it works out for you! An ad-free, printer friendly, downloadable PDF of this pattern can be purchased in my Etsy Shop or from my Ravelry Shop. 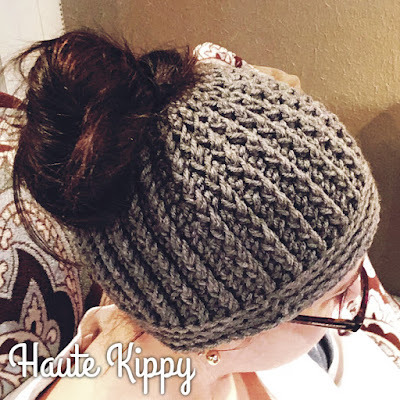 If you just have bun hat fever and you can't get enough, then I suggest you visit allfreecrochet.com and check out their collection of 29 free bun hat patterns! They are all very cute and I'm so fortunate that my original design, "Kip's Bun Hat" was chosen among these fabulous patterns. 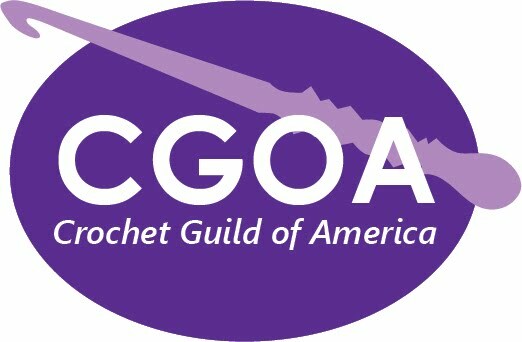 All Free Crochet is an amazing resource for free crochet patterns of every kind. Let me know what you think of this pattern! Comment below, or share your work with me on instagram #hautekippy. Connect with me on facebook, and Ravelry. 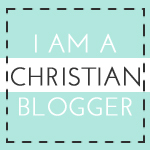 See my inspiration and what I pin on pinterest! You can support Haute Kippy and help me bring the crafting community more fun free projects by visiting my Etsy Shop, where limited quantities of ready made items from my design cache can be found as well as ad-free, printer friendly PDF downloads of my most popular crochet patterns.